I recently completed an invited forum piece on the Portable Antiquities Scheme (PAS) and the Treasure Act and am now waiting to write my response to the five reactions. I note that today the Department of Culture Media and Sport (DCMS) announced the new arrangement for PAS. 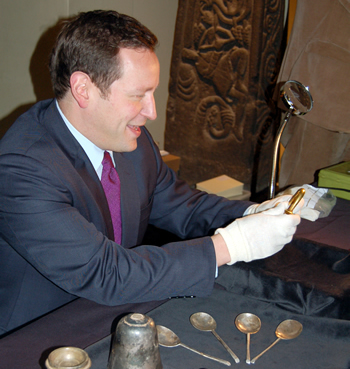 Culture Minister Ed Vaizey "confirmed an additional £1.3m of funding going directly to the British Museum to run the Portable Antiquities scheme" (press release, October 23, 2010). A more detailed press statement was issued by the British Museum ("British Museum to manage Portable Antiquities Scheme, as exciting new finds go on display", November 23, 2010). Culture Minister Ed Vaizey today confirmed that the future funding of the Portable Antiquities Scheme (PAS) has been secured with a reduction of 15% in real terms over four years. From April 2011 it will be managed directly by the British Museum. Following the Spending Review settlement we will wish to maintain the integrity of the Portable Antiquities Scheme as much as we can. Bringing both the PAS and the administration of the Treasure Act together under the management of the British Museum will ensure an effective and efficient mechanism for dealing with archaeological finds made by the public, which also complements the work of curators, conservators and others at the museum. Ed Vaizey "handling treasure". Source: DCMS.